<<CityNews Main Send Flowers to India! We invite associations, organizations and clubs from cities around the US to send in press releases accompanied with high resolution photos for publication in City News. Contributions may be sent to editor@NRIPulse.com. 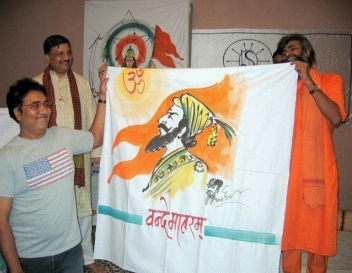 Bottom: Auction Winners proudly hold the paintings Chhatrapati Shivaji Maharaj, sponteneously drawn by Babaji as Rajesh “Chetan” Looks on. Thunderous laughter and national pride filled the air at the Impact Center, Global Mall on Memorial Day, 29th May, 2006. The mood was joyous and the hall was packed. The occasion was a Hasya Kavi Sammelan organized by Sewa International (http://www.sewausa.org) , a non-profit volunteer organization. Aptly titled Hansi ke favvare (Fountains of Laughter), the program featured three stand-up comic acts in Hindi by three poets of the hasya-vyangya (humor and satire) genre. Each of the poets had a unique method of entertaining and enlightening the audience and instilling Pride for India and our culture. The program started at 4.00 p.m. with Abhinav Shukla’s introduction. Abhinavji is a talented young poet who has started his poetic endeavors since his college days and has competed in poetry competitions at the national level. Abhinavji draws inspiration from his day-to-day experiences and converts them into delightful verses. From his college memories to social issues to his failed cooking efforts, Abhinavji touched upon a myriad of topics. He entertained the audience with his stories about Valentine’s Day while provoking thoughts on issues like quota reservations in the education scene in India. His melodious voice and smooth rendition added a charming element to an outstanding performance. By now the audience was growing larger and Sewa volunteers hurriedly arranged for additional seating for the patrons of poetry. Over 300 audience members were enjoying the program, which boasted free entry for all. The sutradhar or the unifying element in the act was Satyanarayan Mourya, fondly known as Baba Mourya. Baba Mourya is a multi-talented performer, artist and orator devoted to furthering the cause of pride in Hinduism. Aside from composing courageous verses in what he calls an apathetic and cynical eon, he excels at painting, cartooning and singing. His experience in television (he has worked with Zee TV as a script writer and program manager producing over 3000 episodes of 'Jaagran', 'Amrit Kalash', and 'Bhakti Geet') aided him visibly as he connected with the audience reminding them of their duty towards their motherland, of the need for national assertion and selfhood. He sprinkled in humorous anecdotes and stories that left the audience roaring with laughter. The third poet in the trio was Rajesh “Chetan”. Rajeshji is a visionary poet of patriotic and nationalist genre. He has been featured by Doordarshan, NDTV and Sab TV channels and writes weekly columns in national dailies. His energetic rendition of patriotic verses reverberated throughout the halls as he called for action to stop violence and romote peaceful existence in the world. Finally, “Baba” Maurya took the stage again and added a colorful touch to the event. An extremely talented artist, he painted images of divinity and inspiration. Lord Rama, Lord Hanuman, Veer Chhatrapati Shivaji and Swami Vivekananda took form with Baba’s effortless brush strokes as the audience looked on in awe. The climax of the Kavi Sammelan saw Baba paint a breathtaking image of Mother India while singing songs of national pride from old and new Hindi movies. The audience too joined with full force, clapping, singing and dancing with him. All the paintings were auctioned off during the event, with the proceeds going towards Sewa International’s activities. The event was concluded at 9.00p.m with a thank you note to the three poets, musicians Manish and Sandeep Sawla, sponsors of the event, Mr. Sanjay Patel (owner of Impact Hall@Global Mall), Mr. Jeetan Singh, CEO of IcoachMath.com, Mr Vishwanath Dasari, CEO of Object Net Technologies and Sewa International’s organizing team. An additional attraction at this event was an exhibition on Hindu Culture and Dharmic Traditions of India prepared by the Hindu Swayamsevak Sangh. The 31 panel exhibition displayed information about various aspects of Hindu culture, History and contributions to the world. Origins of Vedic culture, concept of God, contributions of ancient India to science and mathematics, Ayurveda, and other topics were presented in a simple but appealing format. This exhibition will be on display at various locations in Atlanta over the next few weekends. Sewa International is committed to foster the development and relief of underprivileged and needy people throughout the world and it delivers with transparency through its various projects. Sewa has less than 4% operational overheads and its work is purely based on self-motivated volunteerism. Please visit www.sewausa.org for more information or contact Gaurav Verma at gaurav_verma22@yahoo.com if you want to know how you can be a part of Sewa and make a difference. We look forward to having you at our future events!